To be honest about it, people did not give much thought on utilizing home wind power or of harnessing the same for generating electricity at home. They just felt the chill more when wind blew like hurricane or in blizzard form in the winter, or enjoyed it before the fall when it made the fallen leaves dance to its tune. The role of wind in the daily life was quite limited frankly. But things took a graver turn during the last oil crisis when prices began to rise. Attention was slowly diverted to harness home wind power, at least where it was plentiful. The realization had started to arise that sooner rather than later we would need an alternative source of energy that would be cheaper too. Some experimented with automobile alternators coupled to radiator cooling fans that produced small amount of 12 volt DC power which was promptly stored in 12 volt automotive storage batteries. Using transformers to hike the meager power to 120 volt AC current eventually proved unrealistic and the trials were ultimately abandoned. Meanwhile, business houses that dealt in electrical devices did not remain idle. End of the year 2007 saw the market flooded with numerous mini generators or turbines that could be run with the aid of home wind power, which tied with the utility grid, could reduce the power bill substantially. That is, provided sufficient wind power was available at the site. However, Men, as a rule, irrespective of their age and mental make up, are fond of toys. And these turbines brought enough attraction to men to toy with the idea of harnessing home wind power to generate electricity right within the four walls of one’s home. A novelty that was much too tempting to turn down. But eventually many disappointing souls came away defeated at the game. A large section of these so called entrepreneurs were aghast to find out that their friendly neighbors did not at all like the idea of a wind turbine roaring next door all through the day and night and complained vehemently to the local authorities about this mechanical nuisance thrust upon them. And the authorities had no other alternative but to order dismantling of the turbines; lock, stock and barrel as early as possible!. To add injury to the insult, the wind power was not as trustworthy as believed, sometimes failing miserably to turn the blades of the turbine. The result, as may be imagined, was catastrophic. With the heavy credit load on their head, these people had first tried to resell the equipments that included the turbine, an inverter to transform the DC output of the turbines to usable 12 volt AC along with sundry electrical items to whosoever might be interested in these. But alas, there were no takers for such used electrical goods. 1. Home wind power seldom becomes effective in congested city areas where wind is blocked by large skyscrapers and many high rises. 2. Home wind power in urban areas can not be harnessed with the help of turbines since it disturbs the ecology of the place. 3. Home wind power turbines work best when coupled with solar power electricity generators since the solar units work effectively all through the day, producing enough electricity, while the turbines spin in the night without any interruption. 4. Home wind power driven turbines also work successfully in remote areas where wind blows undisturbed all the time, especially when erected on towers that are sufficiently high to catch the gale. 5. 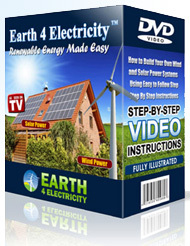 Home wind powered turbines are recommended where utility power is not available. 6. Home wind power generating units resemble much larger wind energy power farms in all respects with the only difference being their size. Otherwise, home wind power generators have the same turbine, torque controller, inverter to convert the electricity obtained from the system to usable 120 volt AC, batteries for uninterrupted power supply and elevated tower for erection. So, they have all the complex problems that are faced by the big power farms, may be in smaller doses.